Jai Nepal Hall is one of the oldest halls of Nepal which is mostly known for its quality surround sound during its initial phase. 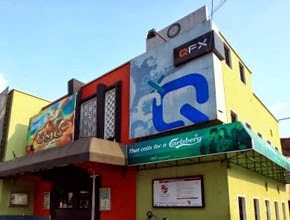 Jai Nepal Cinema hall is located near Narayanhiti Palace in a 10 minutes walking distance from DurbarMarg/Kingsway. Attractions of Jai Nepal Hall: Food Counter, Pay Parking. The show time listed here may not exactly match with the current show times for a particular day since QFX changes its show time regularly. In order to see the exact show time for today click here - Now Showing or visit official QFX Website or type QFXJNC and send it to 4000 to get the latest movie schedule in Jai Nepal Cinema Hall. Regular ticket rates apply for afternoon, evening and night shows. 50% discount on morning shows. Morning show discount is available on weekends. 25% discount on matinee shows. Matinee show discount is available everyday. The discount is calculated based on the regular ticket rate for the day.